e. SSC/Equivalent and HSC/Equivalent both examination Physics, Chemistry, Math (SSC General Math) and Biology Separate Subject. f. Minimum GP 2.0 in physics, Chemistry, Mathematics, Biology and English in HSC/Equivalent examination. b. MCQ Examination 100 number. c. MCQ Examination time 1 hour. Every interested student can apply for Chittagong Veterinary and Animal Sciences University (CVASU) via Teletalk Mobile Operator below instruction. Reply: Congratulations! Applicant’s Name, payment completed successfully for Chittagong Veterinary and Animal Sciences University (CVASU). User ID is (xxxxxxxx) and Password (xxxxxxxx). Please note this User ID and Password. d. Download your 2 copy admit card and print it. vi. There 1 copy self and One copy of two copies of the passport size photograph will be submitted to the examination authority. 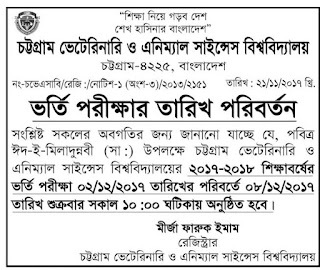 Chittagong Veterinary and Animal Sciences University (CVASU) Admission Examination Center and Test Seat Plan will publish on www.cvasu.ac.bd and Notice Board. Chittagong Veterinary and Animal Sciences University (CVASU) admission result publish as soon as on www.cvasu.ac.bd and Notice Board. Tags: cvasu teletalk com bd. cvasu. www cvasu ac bd. 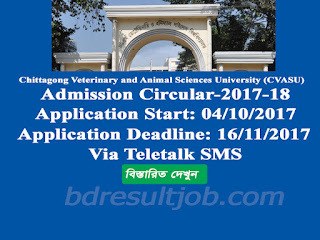 Chittagong Veterinary and Animal Sciences University admission circular 2017-18. www cvasu teletalk com bd. cvasu ac bd. chittagong veterinary ac bd. 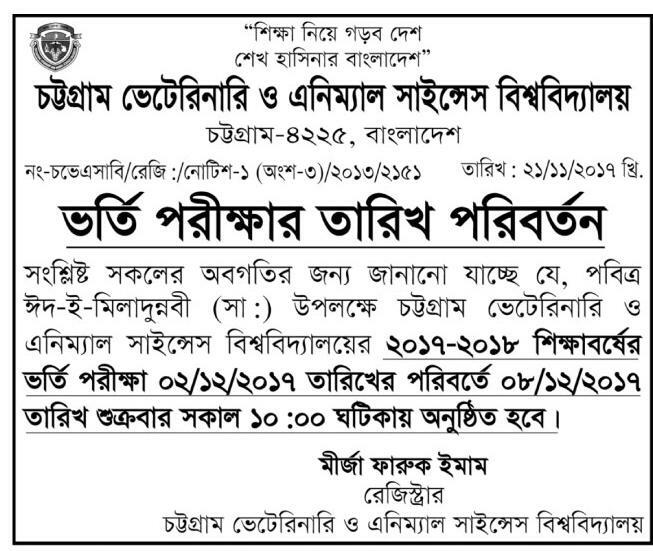 cvasu admission circular. chittagong veterinary university admission circular. chittagong animal science university. cvasu bd. Chittagong Veterinary and Animal Sciences University admission seat plan 2017. cvasu admission admit card 2017. Chitagong veterinary and animal science university admission admit card. Chittagong Veterinary and Animal Sciences University (CVASU) Admission Circular 2017-18, Chitagong veterinary and animal science university admission admit card, Chittagong Veterinary and Animal Sciences University admission seat plan 2017.